C. Suetonij Tranquilli XII Caesares: item I.O. Baptistae Egnatii Veneti De Romanis principibus libri III. Eiusdem Annotationes in Suetonium. Annotata in eundem, & loca aliquot restituta per D. Erasmum Roter. by SUETONIUS TRANQUILLUS, Caius (69-approximately 122); Desiderius Erasmus (1466/7-1536). Lugduni [Lyon]:: Seb. Gryphium, 1556., 1556. Small 8vo. Pagination: 473,  pp. Signatures: a-z8, A-H8. Printer's device on the title page, woodcut initials, printed marginalia; editor's name on title and p. 2 are lined out in ink, three small worm holes from title-page. Nineteenth century quarter gilt-ruled calf, red paper board boards. Early ink name on title of "Carolus . . ." and occasional marginalia (pp. 58, 61, 62, 80-83 [heavy notes] - in the same hand. Very good. Beautifully printed early pocket edition printed by Sebastianus Gryphius (1493-1556), of Suetonius' most famous work and one of the few of his texts that survive, with excellent annotations by Desiderius Erasmus of Rotterdam. Commonly known as The Twelve Caesars, the work contains a set of twelve biographies of Julius Caesar and the first eleven emperors of the Roman Empire [Augustus, Tiberius, Caligula, Claudius, Nero, Galba, Otho, Vitellius, Vespasian, Titus, Domitian]. It is a primary source for the study of Roman history. 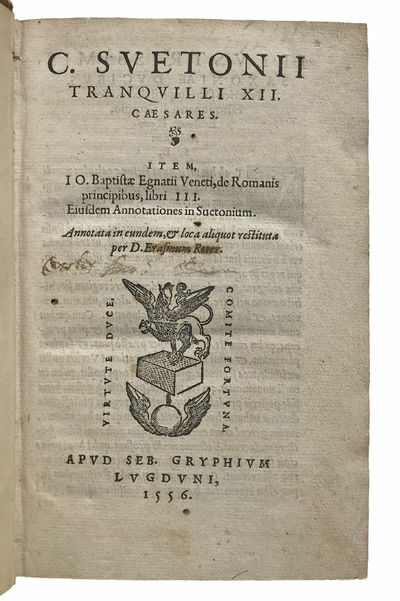 The first edition of Suetonius with Erasmus' annotation was issued in 1533. Baudrier, Henri L., Bibliographie lyonnaise, VIII, p. 284; Gultlingen V, p. 215: I369; French Books III & IV: Books published in France before 1601 . . . edited by Andrew Pettegree, Malcolm Walsby, Leiden: Brill, 2012, 87100. A Specimen of Persian Poetry; or Odes of Hafez, With an English Translation and Paraphrase. . . With Historical and Grammatical Illustrations, and a complete Analysis, for the assistance of those who wish to study the Persian language. by HAFEZ (? ?fi?, 14th century); translator: John RICHARDSON (1740 or 1741-1795). Etrennes Royales, contenant la Maison du Roi et celle [sic] des Princes ; les Conseils et Conseillers d'etat ; les divers Ministeres, Les Presidens de la Chambre des Pairs, de celle des Deputes des departemens, des Cours Royales, etc. Pour l'annee 1817.
by [French almanac; Almanachs] Saint-Michel, Louis; Dominique-Laurent Ayne; Joseph Ayne, Freres.